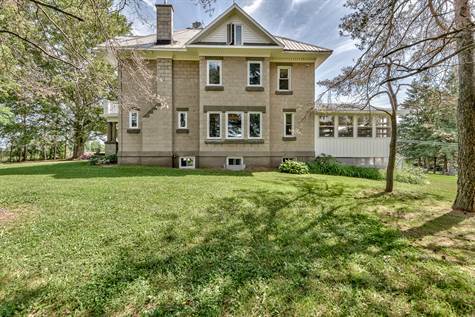 Stately Boyd block four bedroom residence set on 7+ acres has been carefully renovated with various aspects restored and includes craftsman built-in cabinetry with a gentleman’s walk-in closet; located just minutes from Heritage Perth. This home is blessed by a beautiful pond, five very distinctive ‘barn gardens’ featuring drought resistant plants, all creatively staged amidst rockery, stained glass creations as well as garden art such as replicas of the leaf of the graceful ‘Astilboides Tabularis’ plant. Finally, it is a must to mention the shaded court yard garden located just across from the outdoor lounge in a gazebo setting is where “living” really happens. Well maintained outbuildings, each with a particular purpose, are also truly vital components of this amazing property. Welcome home!